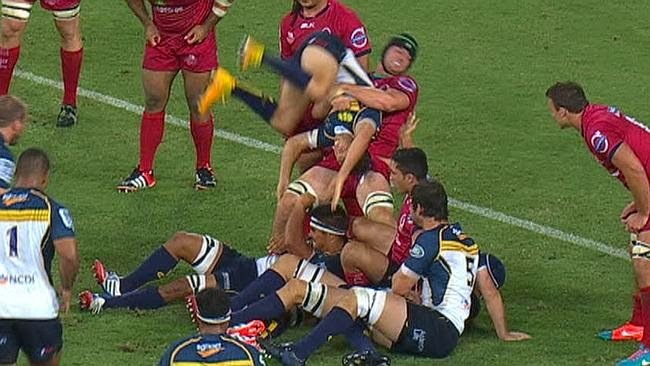 QUEENSLAND Reds flanker Liam Gill has been suspended for two weeks for his reckless wrestling-style tackle on ACT Brumbies halfback Nic White. SANZAR judicial officer Robert Stelzner accepted a guilty plea for the lifting tackle which cost Gill a yellow card at Suncorp Stadium last Saturday night. Brumbies coach Steve Larkham said post-match “it was more dangerous” than a yellow card when pushing for a citing. Gill’s ban means he will miss Friday week’s clash against South Africa’s Lions at Suncorp Stadium when playmaker Quade Cooper is set to return from his broken collarbone. The two-week ban also covers Saturday’s Sunnybank-Brothers club game in Brisbane, a match Gill was never going to play. Gill’s blemish-free record without a citing at Test, Super Rugby and Australian Under-20 level earned a 50 per cent reduction in penalty. He has been suspended from all forms of the game up to and including March 28. The tackle lifted and flipped White like a rugby version of wrestling’s powerbomb manoeuvre. In his ruling, Stelzner said he considered the tackle to be at the lower-end entry point for a lifting tackle sanction. “The incident was indeed a lifting tackle, but given its unusual features, it did not warrant an increase from the entry level sanction to serve as a deterrent, which would have been the case had it been the more usual type of ‘tip tackling’ performed on a player running with the ball,” Stelzner said. “The lifting tackle in this case occurred in a ruck when the player pulled his opponent, who was lying over the ball, out of the ruck, lifted and turned him through the horizontal over his hip causing his opponent to cartwheel before hitting the ground. “The player conceded that the lifting and turning of his smaller opponent placed the opponent at risk of serious injury. The player stated he acted out of frustration and ‘instinctively’ in his attempts to contest for the ball. “The tackle was reckless, carried with it a real risk of serious injury, but at the same time was not the normal type of lifting tackling in which the player’s momentum adds to the danger. “There was no driving of the player into the ground. The tackled player was able to continue playing after the incident.